My clients have shown me that teeth and gum problems are some of the easiest problems to remedy with simple applications of herbs. Now, since some of these may be related to bone health, please also visit that section. Plaque is a sign of poor digestion so for the long term it would be important to address digestive issues. (Usually there is insufficient HCl in the stomach due to stress or acid blockers). Removing plaque is quite simple to do at home. Just brush your teeth with Black Walnut (#90-8) powder. Instructions are given below. Your dentist will be amazed. No really. Tooth Pain is also nicely remedied by the White Oak Bark Tea Bag (Instructions are given below.) It even helps pain that results from jacked braces or other trauma to the teeth. Of course, any trauma should be addressed immediately with Distress Remedy which everyone, especially every parent should have on hand. Then apply the White Oak Bark Tea Bag over the gum area over night. You will be amazed. Tooth Infection or Abscess can be relieved by the White Oak Bark Packet, but instead of White Oak Bark powder, empty 2 capsules of IN-X (#1220-1) and follow the same instructions given below. The IN-X can be taken orally as well 5 – 2X/day to help the whole body resolve the infection. Often an abscess will form with poor lymphatic drainage of the head. Palpate under the jaw and down the neck on the involved side to see if you can locate the stoppage. I have had this situation resolve many times with the application of the PEMF device. Repairing enamel. There is some anecdotal evidence that the White Oak Bark re-calcifies the teeth and bones in the mouth. However, the 1st thing to monitor is the saliva pH because it makes no sense to rebuild what you are continually tearing down. The document on pH has more info on this. You need to spit on a pH strip first thing in the morning. The color of the strip SHOULD turn from yellow (pH of 5.0) to dark green (pH from 6.5 to 7.0). If this is not happening, you need to do the Gentle Liver Cleanse for 2-3 months or until your pH gets at least above 6.0. Whitening the teeth Again there is anecdotal evidence that brushing with Parsley (#490-9) will whiten teeth. The gums are a nice indicator of heart health. If they are grey/bluish, it means the heart is not getting enough oxygen (Cardio Assurance (#553-2) 2B, 2D ). If they bleed easily, the vasculars may be weakened (Bilberry Concentrate 3B, 3D or Rosehips 3B, 3D). If they are bright red it means there is inflammation (check Adrenals) and do Rosehips 3B, 3D. Receding Gums/Loose Teeth are also easy to remedy. The underlying cause is that you are not sufficiently nourishing yourself so address digestion and blood supply as more serious problems develop without these. In the mean time, do the Black Walnut brushing (Instructions are given below) for a week to thoroughly clean the teeth of plaque and reduce inflammation. We want to replace the gums over clean plaque-free teeth. This alone may help some people. But serious cases need to do the White Oak Bark (#730-7) in a tea bag (Instructions are given below.) It is also important to STOP using chemical mouth washes that damage the gums…like Listerine. Black Walnut powder is useful for removing plaque from the teeth and it is also an excellent astringent for loose gums. This procedure can give your teeth the nice clean feeling that you get from the dentist’s office after a cleaning. Empty about 1/3 of a capsule into your palm. Wet the toothbrush; dip it in the powder and brush for about 30 seconds. 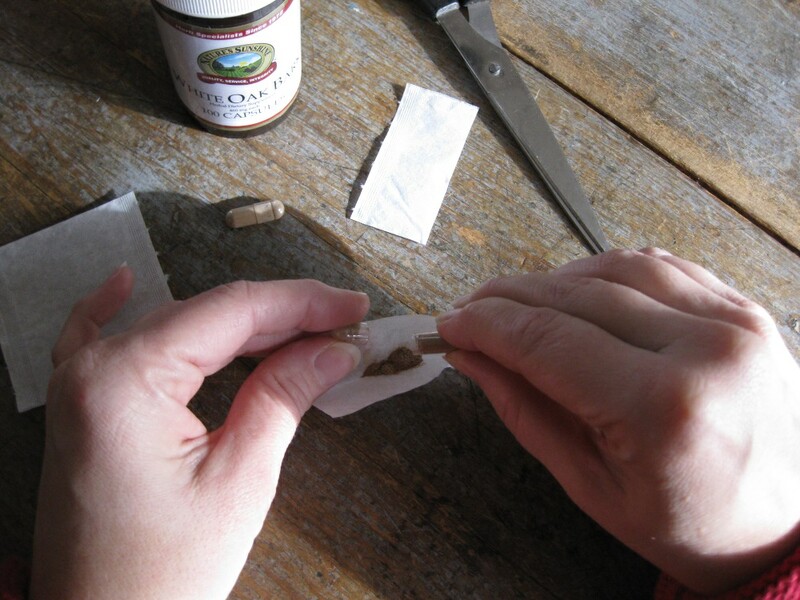 You can swallow the herbal powder (it’s good for you – not so for toothpaste) or spit it out. After about 30 seconds of gentle brushing, rinse the teeth so as to remove as much of the black walnut powder as possible from the mouth and the rinse water is clear. Finish by using a very little smear of toothpaste to suds your teeth to remove any remaining black walnut powder. This can be done everyday for four days, then 2X/week for a month, then 1X/week or as needed to remove plaque and tighten the gums. The only caution is not to leave the black walnut powder on the teeth too long because it can stain teeth if it is left on for 15 minutes or longer. Also, be cautious to use good black walnut powder. This herb often goes on the shelves with high levels of E. Coli since it is often harvested from the ground. Use NSP’s Black Walnut (#90-8) to avoid this. Empty capsule into tea bag cut in half. natural compounds called tannins that tighten loose or swollen tissue. There is also much anecdotal evidence that both teeth, and the jaw that holds them, can be re-calcified by White Oak Bark. This is probably due to its high calcium, manganese and zinc content. To break down bark, dip tea bag several times into boiled water until you observe tea escaping from the bag into the water. Fold tea bag edges to one side opposite of the side that will be placed next to the gum. Place tea bag between inside cheek and gum and press into place. the tooth pain is gone. A great improvement is usually seen in one night with all kinds of tooth pain. Dipping the herb in the hot water breaks down the cellulose which helps to release its ‘principle’ and make the herb more available, so allow at least 1 minute to soak in the hot water. This astringing and pain relieving action of White Oak Bark can also be used for hemorrhoids. Follow the same procedure with the tea bag but apply the tea bag to the hemorrhoids and leave on overnight. Again, the simpler application is to just insert the whole capsule like a suppository and leave in all night (use a little olive oil if lubrication is necessary). The gelatin capsule completely dissolves in contact with any moisture. If this does not bring relief then do the tea bag instead of the capsule. I have been on your website frequently this past year and it is wonderful….it is so informative….i was calling earlier about an appointment for ADD as last time we dealt with my hair pulling and what you recommended stop me dead in my tracts so gentley….it was a such a relief not to have to contend with this anymore….However I also realize that when the body gets out of balance it comes back…so my husband and I both have changed our eating habits to more natural foods…lots of water and probiotics…. (organic recipies and home made salad dressings from The Beauty Detox Solution which has alot of the same info on your website.) I will be going back on the Chinese Nervous Fatigue and try the other two recommended herbs for the ADD as well…Six months ago I got off my Add medication becasue it wasn’t helping two weeks out of the month when I have a hormonal flux…(ie changes in mood, thoughts, coordination, cravings, forgetfulness so I may need an appointment for that unless the three herbs for ADD help with that…..) .I am so grateful for your work and reasearch and will continue to follow the advice you have posted (Blood type eating and Insulin resistence recommendations…..Thank you again for making all this information so available….I still have my account with nature sunshine so when I order I hope you are still getting the financial gain when I order, if not let me know. I was surprised to see your comment about hair pulling as I have the same problem. I’m wondering what the recommendation is for that? Thank you in advance for any help! I thought I was finally done with it after doing it for about 3 years. The urge went away almost completely for about 5 months and then it came back with a vengeance. This is an emotional response to old trauma usually. You can try C. Nervous Fatigue but be sure to visit the Address the Stress post. Pat, I LOVE your new website. It is FANTASTIC and I know it took alot of work but boy it’s worth it to all of us. Has anyone tried the white oak bark to do with receeding gums and loose teeth? Has it helped and worked? Yes and yes. It works quickly with receding gums but takes a while to address loose teeth. There are, however, underlying issues that should be addressed like circulation and inflammation issues. Rosehips helps both of those as do other nutrients. How does it help receding gums? Please explain. I am in good health but have receding gums. I just ordered your recommendations (White Oak Bark and Myrrh oil). I also have cold hands and feet all year round. What else can I take to address the circulation issues? Thank you! The White Oak Bark will give you amazing results, but you are right about your grouping of symptoms being related to circulation issues. Are you on a medication that impairs good circulation? I refer you to the circulation document for the reasons for poor circulation, and recommend you consider Bilberry 2B, 2D. Also follow your blood type diet as there are foods that thicken blood depending on your blood type. So I would avoid those. Cold feet and hands usually thyroid is underactive. Olga, did you know that the list of underactive thyroid symptoms in western medicine looks like the list of liver imbalances in Chinese medicine. Please see my endocrine post for more explanation. My dentist wants to pull my tooth because I have a large cavity, is there anything I can do or take to make the cavity go away? I have been taking herbs about a year and So much better, used to be extremely inflammed, no more! Also no energy, so much better! Love this site and appreciate all this information. Thank you. It is in your best interest to do all you can and see what ‘something natural‘ can do for you before you undergo medical intervention. Ask about the long term implications of this procedure. 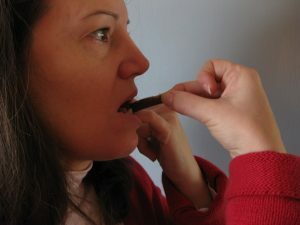 Begin brushing with Black Walnut and then do the White Oak Bark tea bag in the area of the tooth. Many people have avoided losing teeth and having root canals but you won’t know until you give serious attention to doing this. Hello, I developed a abscess last week, affect my tooth, gum, cheek and jaw, with lots of swelling and it is very painful. I have been doing everything I can to avoid loosing this tooth the filling fell out and bacteria must have got into the space. I done charcoal, green tea poultice, now white oak bark. I do not have a dentist, but I brush and clean my own teeth, rinse with tea tree solution, but my gums have been receding now for almost 30 years. I am 51 and I do not want to lose my teeth and this abscess scares me I do not want to develop septicemia. It’s already traveled to my other teeth, I think. My entire right side hurts. The answers to many of your questions can be found in the original post or in the responses to other’s questions. Charcoal is a nice polish but white oak bark is astringent. Follow the directions exactly in the post. I would stop the tea tree as that can be irritating. The whole right side hurting is a sign of lymphatic stagnation and you can usually find out where by palpation. Oil pulling, in my opinion, is a waste of time and oil. Please reread this post, follow the appropriate links, and read the responses. First of all the white oak bark needs to be broken down by heat to release its therapeutic value. So the directions given here should be followed as written. Some people experience constipation from drinking the tea so it should only be drunk with severe inflammation of the GI track, and even then there are better remedies. You don’t need to take a probiotic if you balance your digestive pH. And distilled water is unhealthy because the distillation process does not remove volatiles which are harmful, and it removes minerals which are needful. Hi Pat – I am trying desperately to avoid a root canal or extraction. I have pain as well as bone loss in the jaw area of the problem tooth. Can the IN-X packets be done in conjunction with white oak packets, and would this be done on different days? Thank you – your website is incredible. Yes, Katherine, you can do the IN-X with the White Oak Bark, at the same time or on different days. You should also take the IN-X orally because this situation usually results from lowered circulation to the area or lymphatic drainage from the area of the jaw. Confirm by palpating the neck area on the involved side and comparing tenderness or lumps with the opposite side. Sometimes because of compromised fluid flow through the area the PEMF is very helpful to facilitate drainage and circulation. You can call around to see who might have one – often chiropractors do. Hey there Pat! Wow I stumbled on this website by fluke and boy, am I glad I did. I do have a question though, I was wondering what I could possibly do for red, somewhat swollen gums? Ive tried tea teee oil but that did absolutely nothing. I know that there is laser treatment out there but I much rather use natural remedies. Any suggestions? I would really appreciate a reply. Thank you! The condition you are reporting can be a harbinger of more serious unseen heart tissue issues. But first, the reason Tea Tree didn’t work is because EOs find their greatest application in cold conditions, i.e. if your gums were pale and greyish, then use it. They are hot and swollen so the white oak bark tea bag will help topically but this needs to be addressed from the inside, too. SO more importantly I’d be looking at anti-oxidants esp for the heart and vascular system. To this end consider using Grapine HP 2B, 2D and Varigone 2B, 2D to begin. Wow! Thank you so much for the fast reply! Can’t wait to try everything out! Hi Pat, I contacted you a couple weeks back regarding receding gums. I’m currently following your recommendation of INX and IX. I’ve also been brushing 2x/day with black walnut powder for 8 days, and just started the white oak bark tea bags on the gums. My question is how long I can continue the black walnut? Based on what I’m reading, you suggest 2X/for 4 days and then 2X/wk. I’m not getting any relief from the pain and the appearance of the gum line isn’t improving. Can you guide me on the safety of the black walnut and counsel me on realistic expectations for improvement? You have an AWESOME website and I’ve been learning a ton! Thank you for your work in this area!! It is helpful to know that natural things work gradually, usually. 2 weeks is not a long time in herbal program terms. I’d give the white oak bark some time to work, and remember that the gums are indicators of a weakened digestion. Improving the digestion improves the gums; but improving the gums does not improve digestion. The I-X, with time will help digestion as it is a liver formula. IN-X tells of a lymphatic stagnation issue especially if there is pain. Again, these take time. If you tend to be prone to lymph issues you may want to find a chiro with a PEMF type device or purchase an inexpensive one yourself. Hi Pat, thank you for your response. I’m wondering if I’m doing too much in my teeth/gum regime? Here’s my regimen: I “blot or tap” 2x/day, am/pm. I brush with black walnut am/pm with a very light flossing prior. I rinse and brush with Auramere herbal toothpaste to remove any residual of the walnut. I then put sea salt and sometimes Vit C ascorbic acid in my waterpik. At night I put the oak bark packs on my gums. My gums seem to be getting worse; I’m trying not to get upset and understand that this’ll take time. I’m afraid to look at them in the mirror, as the coloring is pale and the gums are exposing the edges of some crown work on my 2 front teeth. It’s too upsetting to take stock, but based on how they feel, it seems progress isn’t coming. Also, I’m taking INX and IX as instructed and rebounding 9 min/day for liver/lymph support. I’m checking in with my chiro on the PEMF therapy as you suggested. Should I tackle the digestion thru either 9 days of broth to “reset” my gut, or the HCI therapy or the gentle liver cleanse or is this just too much already for my body? Maybe too much attention. Things that I would change are: floss every other day, not 2X/day; use only a very light smear of your toothpaste and there is no need to brush vigorously; use only a soft bristle brush; stop the sea salt and vitamin C in the water pik (these are irritants), and use silver sol instead – after you flush all the salt out of the unit. Take the vitamin C internally. 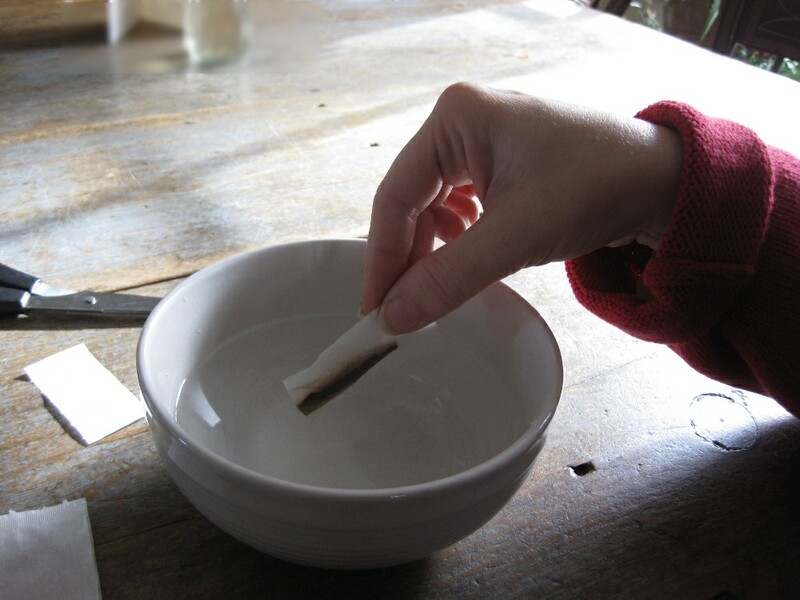 Are you dipping the white oak bark tea bags into boiling water and allowing to cool before applying to the gum? I will look into adjusting your program. Pat, to answer a couple questions…I’m barely brushing teeth/gums w/an ultrasoft toothbrush. I’m letting the oak bark teabags soak for 1 min but not letting them cool, so I’ll make that change right away. I will take in all your other suggestions as well. Should I use NSP’s Vit C Ascorbates or another NSP Vit C option? I have 2 cavities that have purplish coloring around them. Dentists said something is going under the cavity causing the purple to be around tooth and cavity. Any ideas? The blue/purple coloring means lowered circulation. This color is an indicator to us that trying to remedy the situation with anything that requires good circulation (like herbs) may not be effective. So non-herbal interventions like the PEMF are helpful here as is your energy work. Another intervention that I would consider is essential oils applied topically as they are stimulating to local circulation. It’s been awhile since I’ve been in but have a question for you. I have a tooth that has started to hurt and when I checked it, it looked a bit grey around the edge. Reading online seems to indicate it’s dying which means a dentist will want to do a root canal or extraction. I want to avoid both. Will these protocols on this page help in your opinion? Should I try all that is listed or is there something else that might help. Thanks for sharing your wisdom and experience. The discoloration isusually due to lowered circulation so taking herbs won’t be as effective as something that can better penetrate the tissue, like a PEMF (see above post). Jan used it and in short order the discoloration and pain was gone. It isn’t clear from your post what problem you are trying to address. Plaque? Receding gums? Gum inflammation? Abscess? Cavities? Were the blisters caused by the white oak bark or the black walnut? And remember, issues with teeth and gums originate in the digestion which should be addressed with the highest priority. It is also important to put the White Oak Bark teabag in hot water to break it down as I described in this post. Then consider taking PLS II internally 3B, 3D which is a good tissue rebuilder. The white oak bark is a nice tooth cleaner and polisher. After using it I would rinse out very well. Finally, I have found Silver Shield to be very helpful for inflammation anywhere in the body. Consider swishing and keeping it in mouth after brushing. Pat – I have had a cavity in one of my molars (lower left side) for over two years. I have receding gums and the cavity appears to be below the normal gumline. Also, surrounding the cavity and towards the root there is brown discoloration. At first I thought it might have been from drinking too much black tea, but the two adjacent teeth also appear to have the brown color towards the root. I also discontinued black tea (now primarily green). I am reluctant to go to a dentist and saw that you wrote about using Devil’s Claw. I have started brushing with Devil’s Claw. I understand it may take awhile to see results. Questions: What is the protocol for brushing with Devil’s Claw? Also, why do you suspect that it works? Just curious. Thanks. Pat – For further clarification, I suspect that the discoloration in my teeth is from poor circulation, so I have also been taking Bilberry and Perfect Eyes (which I believe benefits small capillaries). I tested my PH and it is within the normal range. I agree with poor circulation contributing to the discoloration and the herbs you are taking should help with that issue systemically – even the gums. I brush with White Oak Bark and have seen improvement with enamel integrity. You are right. It takes time. The White Oak Bark teabag will make an improvement in the gums too. One can only conjecture that the intelligent body would heal the tooth along with the gums. I would brush the teeth with the white oak bark prior to applying the teabag so that any food residue is removed. Pat – I purchased a PEMF device. Question – Do I just hold it against my jaw (below the discolored teeth) for about 20 minutes, or do I do something else? Thanks. In addition to the area of the jaw where vessels are feeding the teeth, another beneficial site to apply the PEMF is under the jaw line near the tonsils pointing up towards the mouth. I have a couple of titanium plates around my right eye (the bad teeth are on the left side). The instructional videos for the PEMF indicate that use of the PEMF near titanium implants may be uncomfortable. Pointing the PEMF upwards may be possible without affecting the titanium may be possible, but I am not sure. Any thoughts? (Also, do you have a recommendation for a water distiller to use to make ionic colloidal silver – I want to avoid BPA’s in store bought distilled water.) Thanks. PS I can’t advise you on water issues. My 4 year old daughter, who has Trisomy 21, has cavities. I am doing all I can to get rid of cavities naturally. I am brushing her teeth after every meal plus her snack, 2 teeth at a time, 20 strokes each pair, front and then 20 more strokes in the back. I use Redmond Earthpaste. She still doesn’t rinse, so she swallows. How could I adjust your recipe for the white oak bark for her? She wouldn’t be able to handle the overnight tea bag in her mouth. I’d appreciate your advice very much. Thanks. First, Vicky, it sounds like too much brushing to me. Weak teeth come from weak digestion so make sure all aspects of digestion are working. You could replace some of the Redmond clay applications with boiled white oak bark. That is, empty about 7 caps of white oak bark powder into 1 cup water in a small pot and bring to a rolling boil for about 20 seconds (remember it is a bark which needs breaking down). Allow to cool, mix well and pour into ice cube trays evenly distributing the powder. Freeze, and after frozen, empty the cubes into a ziploc bag and keep in the freezer. (This is so you don’t need to make some up every day) Each day take out a cube, place in a glass and allow to melt back to a liquid. Dip her toothbrush into this and lightly go over her teeth with the powder after eating or polishing (redmond). This can also be done at night before bed and it is perfectly safe for her to swallow. Thanks, Pat. I appreciate your valuable help very much. I followed the recipe you gave me. It’s quite watery; is that ok? Yes, that is fine. You can make it more pasty by reducing some of the water but the point is to brush with the broken down powder, i.e. the sediment after boiling. I just got delivery of some Myrrh and White Oak powder, one thing that I am beginning to question is it says ‘pharmaceutical grade’ on the label… does this mean the active molecules may be have been damaged by processing? Would it be better if I can get unprocessed powder instead? Great article by the way, very helpful and informative, I really like the tea bag packet idea, fantastic! I’m not sure exactly what you got or where you got it from but ‘Pharmaceutical grade’ is more a marketing term than a valid quality/free-from-contaminants claim. You can try doing the teabag with that and see what happens. I’m using 3% Hydrogen peroxide on my gums as mouthwash and it works, nothing worked before. Now I’m going to start using white oak bark. Thank you for info. I’m not sure what you find that H2O2 works for, but keep in mind it is an oxidizer, which means it is aging the tissue. Using it short term for acute infection may seem to work, but there is a price to pay. I think you will find the white oak bark to be soothing and astringing to the gums. improve it. This just takes me a step backward and the tooth feels even more uncomfortable. also picked up Amla powder and take that in water about 3 times per day. The Chlorhexadine scares me a lot, such horrible ingredients. Is there anything else I can do Pat, to promote ligament healing, gum tightening? And something to replace this Chlorhexadine to fight potential infection ( no infection yet). I am determined to keep this tooth as I have nothing wrong with any of my other teeth. Thank you with all of my heart! First response to any tissue trauma is Distress Remedy. It pulls the tissue out of shock so healing can begin. Second to remember is that the older we are the longer it takes for the body to repair so don’t be in a big hurry. To improve debris removal and circulation to the area I would find someone who has a PEMF and use it over the area. Often chiros have them. I would avoid using the tooth if possible. Apply the White Oak bark powder tea bag over the gum above the tooth, not on the tooth. I am not a fan of coral calcium. To avoid tissue deterioration, rub the http://patblocknd.net/?sn=3859-5 over the area instead of the drug, or in addition to it. Just put a drop of the oil on your finger and rub it on your gums. Sorry about the taste. 2X/day. With these applications you need not fear infection. There are Chlorhexidine resistant strains that only your intelligent body can handle. Wow. What a great site! I was told by dentist I need 2 root canals. I have been treating teeth with MMS and colloidal silver applications. Cut sugar out of diet. Abscess near gun line has popped up and grayish almost purple gum coloration behind the dying or possibly dead tooth. Trying to heal without invasive root canal (which I refuse to do) or implant. Can you help direct me on how to deal with or remedy this situation? Thanks so much. Was going to buy white oak bark ye but wasn’t sure if there was something more appropriatle. I was told a focal infection underneath tooth was the cause Anne seeing what can be done. The colloidal silver seemed to help but the discoloration in my gum line near that tooth has me concerned as to what to do next. Thanks you! Yes JC, just follow the directions given above using the essential oils on the flannel at night. The abscess is not a bad sign but rather the body getting rid of debris which the clogged lymph system has not passed on to the liver. If it drains, don’t be alarmed. It is an intelligent response of the body. Consider other recommendations above such as the PEMF. Can i use cotton ball vs flannel at night? Is there a way to repair tooth if it is dead/non-vital — the dentist/entodontist said that it was non-vital, but it doesn’t feel dead. i am going back for x-rays in 2 months after trying this protocol. i have the myrrh, thyme and clove and will try this out for sure! re the PEMF — i live in Los Angeles, do you know of any people to meet with who are experts or have these machines to do some work on my jaw that’s in issue? thanks so much for your help. so very helpful to know my options. You want something that can distribute the EOs along the gum. My concern with cotton is that it might hold the EOs inside the fibers rather than hold the EOs against the gums. You can try other flat fabrics too. Please read this post to prepare for any medical intervention. I will send you info on the PEMF and you can contact the company to see if local practitioners near you might have one. Do you have an alternative to Devil’s Paw. The link no longer leads to a product. You are right, Devil’s Claw is no longer available. Fortunately God’s remedies are abundant and redundant. I believe the saliva can either rebuild the teeth or weaken the teeth and this is related to digestion which is often related to liver function so that is the best place to start. Pat…What protocol do you recommend for someone who has several amalgams? Please enter ‘mercury’ in the search box on the upper right of the page and you’ll see several posts where I discuss that topic. I just found your site searching for something that would help my mom with her dental issues. She has had bad teeth for most of her life and her dentist is recommending she get full dentures within a few years because almost all of her teeth are loose and her gums are receded. Do you think using white oak bark would at least help her a bit over time, or should she try something else? Keep in mind thatteeth problems tell of digestive problems so make sure to address those. I would alternate between the White oak Bark and the flannels with the EOs on them. What are your thoughts on using bentonite clay to remineralize teeth? Or as an ingredient for an every day brushing powder? I have problems with my front teath my gums are subsiding. I got the white oak bark powder. My question how do I use it and what else do you recommend ? Sorry I mean to say my gums are Receding what would you recommend? 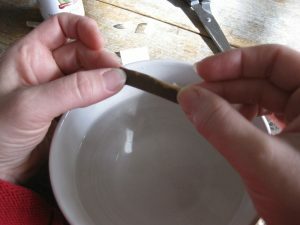 Simply put about 1/4 teaspoon in an empty teabag as shown in the photos. Steep it for a minute or so to break down the bark some and then put it between your cheek and gum as described here. Yes GiX, that is fine. But as often as I have done this and recommended it, no reports of swallowing the teabag. Hi Pat Great site and info! I am (was) having toothache signifying possible root issues in one tooth but since reading this page I think it may be sluggish lymph. Nodes were swollen on one side close to the tooth in question. It’s gone down almost to zero since I put attention on managing the lymph but I know the problem is still lurking so I want to get some of your In-X, White Oak Bark and also Black Walnut to brush with. also have a small cyst on the back of my neck with those products help with that? Wondered what you think of the theory of phytic acidic foods and teeth. also you view on bone broth. Sorry for the delay in answering. My website was hacked, then an update crashed it, and I wasn’t getting notifications of posts. Yes tooth pain is often associated with sluggish lymph as are ‘cysts’ and I’m glad you are getting relief. In my experience working with 1000s of people, problems come from inflammatory foods, and which ones those are depend on your blood type. Lymph issues can also come from a congested or deficient liver and if you still have that cyst, consider doing the Gentle Liver Cleanse. Do you have reccomendation for a toothpaste to use alongside the the black walnut powder? Since you are only using a slight smear (less than 1/16 tsp) of toothpaste, any should do fine. A soft bristle brush is advisable. At the top of the page on the navigation bar, find the ‘Store’ link and follow the directions to get the herbs I use outside the US. Thank you for your wonderful website and research. Do you have any suggestions on how to shrink/eliminate a traumatic fibroma on the tongue? Distress Remedy is best applied to ANY trauma soon after it occurs to get the tissue out of shock so it can heal. That will give the quickest results. Soon after the trauma you can do 3-4 applications at 1/2 hour intervals. If it is an old trauma,say more than several days, then you can still apply it several times a day but it will take longer to see results. Thank you so much, Pat. The trauma is at least a month old at this point. A few days ago I started the Distress Remedy and I am applying it several times a day. I’m hopeful it will improve. For loose teeth, can you do the white oak bark on the gums every night? Or is it best to only do it a few times per week? If it’s best to space it out, can you do it every night if you move it to different locations? It is perfectly safe to do the white oak bark teabag every night. You can also alternate by placing a teabag on the upper and lower gums on the right side and then the next night do the same on the left. Thank you! Do you think this is the best route to go for loose teeth? I have been dealing with this for 4 months, and my dentist wants me to go see an orthodontist for braces or some kind of appliance. It is so confusing because that doesn’t seem best to me, but I also don’t want my teeth to get any worse. Also, will having white oak bark on my teeth every night cause staining? Yes, I would say it is the best route (plus diet). I don’t see how braces solve the problem – unless you wear them for the rest of your life (?) It is best, clearly, to get your own jaws and gum tissues to hold your teeth in place. You should notice a difference within a week, unless you are doing things to cause your problems. So reduce your inflammation by strictly following the diet according to your blood type. I use White Oak bark and have not known it to stain, nor have others. Do you know what causes white spots on the teeth? What can be done for those? My 10 year old son has some on the bottom of his top front teeth, and I just noticed one on my 8 year old daughters top front tooth too. This may be caused by an energy disturbance on the large intestine meridian which governs the teeth. Holding the ring finger, as simple as that sounds, helps clear obstructions on that meridian. See the simple self help under this link. Do you know how to help teeth that have become translucent? This has just happened to my top two front teeth over the last couple of weeks. Have you recently been put on a medication? This may be caused by a lowered blood circulation to that area….and which may also be affecting other areas too. Do you have any ideas for night time teeth clenching? I’ve tried magnesium and lavender, and nothing works. From my observations this clenching is related to the large intestines. Please read the posts and begin doing the Abdominal Massage nightly. Also to reduce the inflammation, follow the Blood Type Diet. Great pages you have here, though! I’m enjoying the education! Thank you Rosa for your kind words. Blank Walnut shouldn’t stain teeth whose enamel is in tact. However, tooth pastes have abrasives in them and many people have enamel scored by vigorous brushing with abrasives. Some dental offices use these types of cleaners too. For these reasons I caution against leaving black walnut on a long time. White Oak Bark is helpful to restore enamel and astringe the gums as I have described here.